Dogs are meat-heavy omnivores: evolving beside humans during domestication, carnivorous wolves learned to thrive on human foods. Today, some “human” foods – like blueberries and sweet potatoes – are part of a balanced diet for dogs. However, even though your pup could be helped by the inclusion of fiber and antioxidant sources in the food, your dog might not be so happy by the inclusion of wheat and corn. Grains are grass seeds, used in bulk to create cereals and flours. When the entire seedpod is used (hull and nut), that’s a whole grain. When only part of the seed is used, that’s a refined grain. Examples of grains you might eat are wheat, corn, rice, quinoa, barley, millet and oats. Grains vary in nutritional value, and some grains are considered controversial for regular pet consumption, such as wheat and corn. Can dogs and cats be allergic to grains? Absolutely – especially the most common grains, corn and wheat. Grains are among the top five allergens that cats and dogs are sensitive to. If your pet is showing signs of food intolerance, chances are good that grains may be to blame. Some pet owners report grain intolerance symptoms in their dogs, including dry skin, itchiness, bald patches, diarrhea, defecating three or more times daily, and obsessively licking paws. If your dog is exhibiting symptoms of food intolerance, you may want to try a grain-free food before other lifestyle changes. Why go grain-free? Let’s count the reasons. Your dog may be more energetic. Grain-free foods tend to be higher in protein than other pet foods. This means more energy available for your pup to use – and less energy spent digesting. Pet owners report healthier, shinier coats – and less shedding. Increasing the meat in your dog’s food usually correlates with higher rates of fat, as well. For dogs, this means more oil and nutrients to maintain a beautiful, healthy coat that isn’t brittle and prone to breakage. If your pup is sensitive or allergic to certain foods, switching to a high quality grain-free food may help clear up health issues. Better digestion (fewer poos and less stinky, too!). Flatulence in dogs can be caused by food sensitivities. Mostly indigestible food like wheat causes your dog’s bowel movements to be, well, bigger and stinkier. (Wheat is actually highly digestible when used in pet food – alternate sentence here could be: When a dog is sensitive or intolerant to a particular ingredient, this can interfere with proper and healthy digestion. If you’re clearing the room every time your pet passes gas, you may want to consider a grain-free food. Less food AND better nutrition. If your dog’s food has grains, he or she may have to eat more of it to get the essential nutrients it takes to survive. With more meat in a grain-free food, your dog won’t have to eat as much to feel full and satisfied. 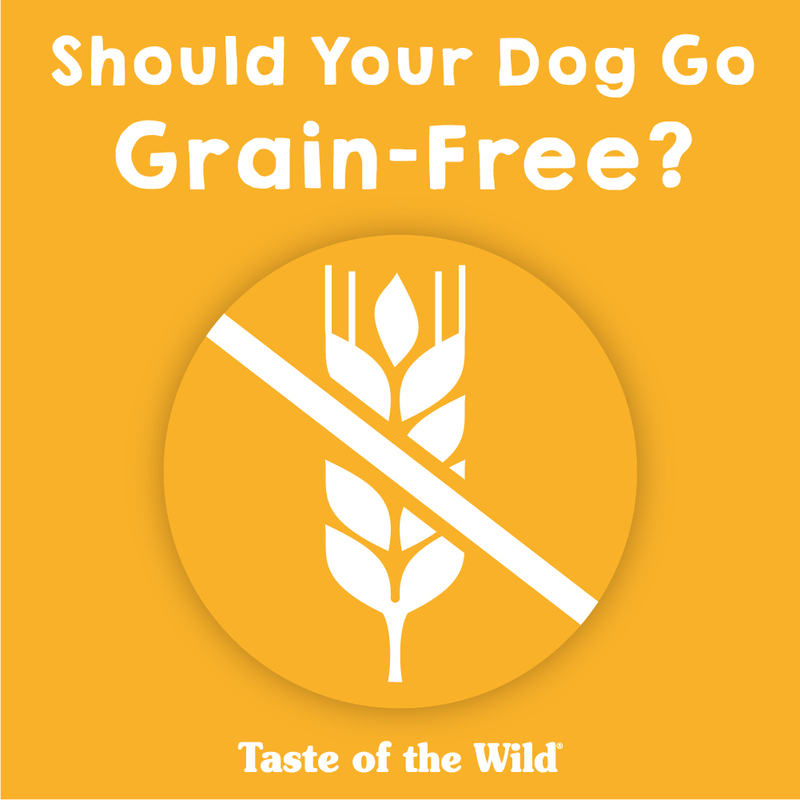 If my pet isn’t sensitive to grain, why bother finding a grain-free food? If you have a pup who’ll eat just about anything, you might not feel it’s important to feed a grain-free food. However, many dogs don’t begin exhibiting allergy symptoms until their senior years. An investment in grain-free food can be like insurance against costly food allergy-related veterinary bills in your dog’s golden years. Besides grains, what else should I look for in a dog food? Read your ingredient labels and find a dog food with a named meat as the first ingredient. Dog food ingredients are listed by weight, so finding a meat-first formula means your dog will be eating more meat than anything else. Choosing a named meat means finding a meat with the name of an animal – “turkey” not “poultry product,” “roasted boar” not “pork meal,” and “salmon” not “fish” – so you know exactly what your dog is eating. Check out all of the Taste of the Wild formulas, and contact us if you need help choosing a grain-free formula for your dog.